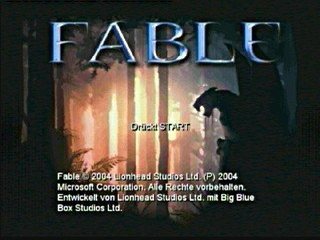 Released in September 2004 for Xbox and PC, Fable is a role playing game in which your every action determines your skills, appearance, and reputation. You start the game as a child and finish it as an old man. Do you choose the path of righteousness or dedicate your life to evil? In September 2005, Fable was expanded and rereleased as Fable: The Lost Chapters. The Lost Chapters features all the content found in the original Fable, as well as additional new content such as new monsters, weapons, alignment based spells, items, armor, towns, buildings, and expressions. Best time: Single-segment 1:37 by David Arnold on 2010-02-08. - Whilst using assassin rush or rolling you are invulnerable. Also, (this doesn't happen in my run) but when you are in berserk you can't die from a single hit. - the in-game timer is paused when you are in any type of menu. Be it upgrade menu, the main menu or in trader menu. I abuse this to the fullest (kind of) so i can buy/sell things so I can upgrade my sword and bow at certain times in the run. I try to do buying/selling as quickly as I could to not bore people viewing it. - i used the trick '3nki' discovered. when you have hit so many targets in the time during the archery and will training. you shoot the guild master so you go to detention but instead of spawning at sythes tower you end back up at the training area, with the time ended and you somehow passing the test. - i wait for the last second to kill the guards so i get the highest combat multiplier after i defeat whisper (which was 9 this time). Then i use the two age potions. - i upgrade physique to 3, health 3 (just in case i get hit by dragon jack), rush to 2, speed 3, accuracy 3, physical shield 1, multi-strike 1 and multi-arrow 1. I was seriously 2 exp points off been able to upgrade magic power to 1. - i upgrade enflame 3, multi-strike 2, berserk 2, physique 5, speed 5, accuracy 4, slow-time 1. - battling whisper always turns out horrible for me. however, i was able to kill whisper this time. Since, I did this i will be able to upgrade berserk to 4 in the future! !